Tips to Choose a Trip in Ten Minutes. Designed for the impulsive buyer of travel Not recommended, but if you are going to blitz the info, do it with some structure from us. We are noticing more travelers are too busy to really do their homework so we created this “quick and dirty” list to help out. 1. Make sure the people in the materials look like you! 2. Small print averse? at least read cancellation penalties. 3. Hotel quality: google the hotel used in the capital city on the itinerary for a general flavor. 4. Red flag the word: “from” it means you are looking at the lowest price. 5. To gauge pace: if Breakfast Lunch Dinner are included, you are on a slow moving trip! Ths does not apply if you are in exotic locations where alternative meals are hard to get. 6. Financial security: Check for Travel insurance availability. Pay the insurance company not the tour operator for it. 7. Forget # of days, most companies include travel days. Only look at # of nights! 8. Check trade association memberships like IATA and USTOA. 9. Prompt responses from the company mean they are customer friendly. Prompt email responses means they cater to internet savvy travelers. 10.Check that the company has a street address. Join our Christmas trip to Morocco. Solo travelers will get a room share or a single at the double cost. 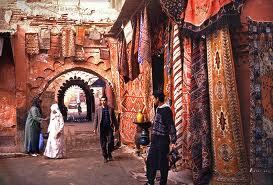 Go see Lawrence of Arabia for an idea of Moroccan scenery! !